The purpose of this activity is to identify global patterns and connections in environmental data contained in the GLOBE Earth Systems Poster, to connect observations made within the Earth Systems Poster to data and information at the National Snow and Ice Data Center, and to understand the connections between solar energy and changes at the poles, including feedback related to albedo. 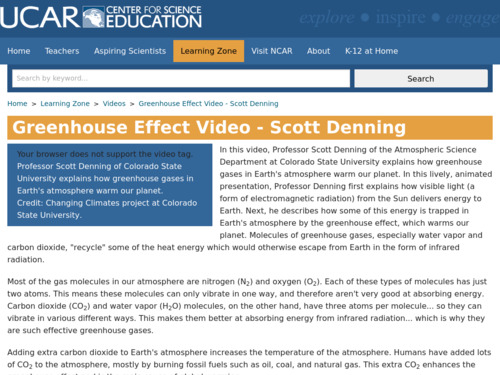 In this short video, atmospheric scientist Scott Denning gives a candid and entertaining explanation of how greenhouse gases in Earth's atmosphere warm our planet. 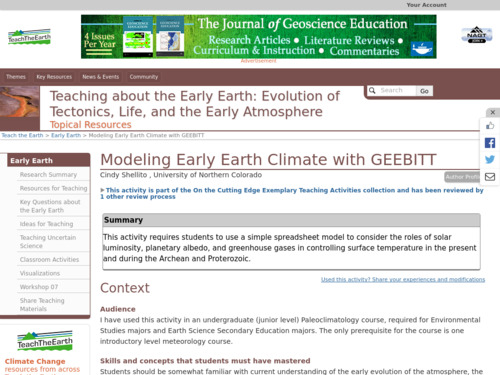 In this 6-part activity, students learn about climate change during the Cenozoic and the abrupt changes at the Cretaceous/Paleogene boundary (65.5 million years ago), the Eocene/Oligocene boundary (33.9 million years ago), and the Paleocene/Eocene boundary (55.8 million years ago). 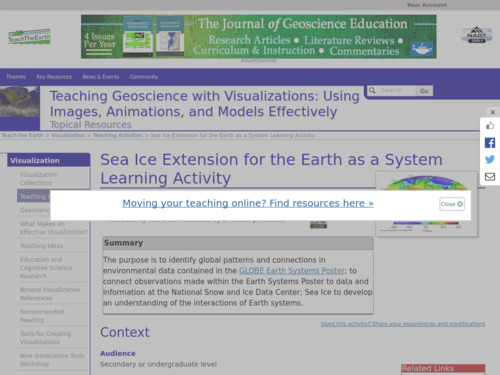 This activity supports educators in the use of the activities that accompany the GLOBE Program's Earth System Poster 'Exploring Connections in Year 2007'. 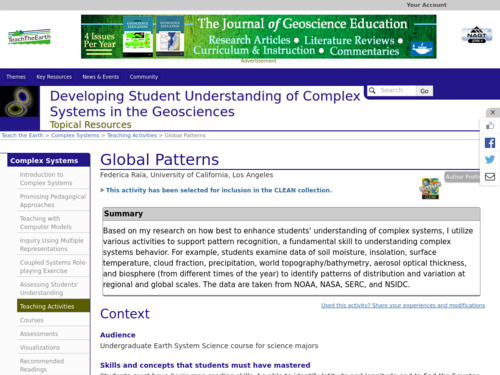 Students identify global patterns and connections in environmental data that include soil moisture, insolation, surface temperature, cloud fraction, precipitation, world topography/bathymetry, aerosol optical thickness, and biosphere (from different times of the year) with the goal of recognizing patterns and trends in global data sets. Students gain experience using a spreadsheet and working with others to decide how to conduct their model 'experiments' with the NASA GEEBITT (Global Equilibrium Energy Balance Interactive Tinker Toy). 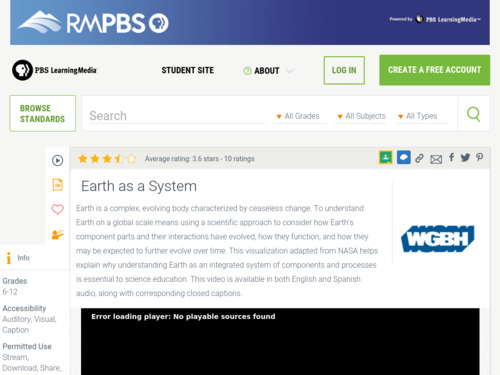 This activity helps students become more familiar with the physical processes that made Earth's early climate so different from that of today. Students also acquire first-hand experience with a limitation in modeling, specifically, parameterization of critical processes. 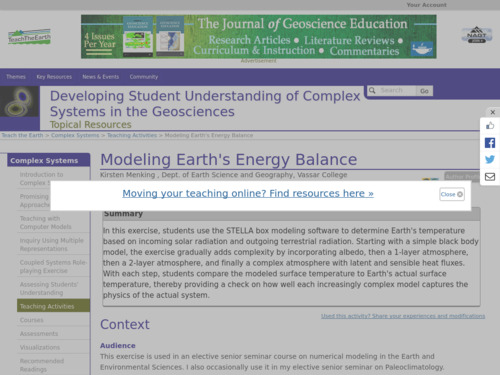 In this activity, learners use the STELLA box modeling software to determine Earth's temperature based on incoming solar radiation and outgoing terrestrial radiation. Starting with a simple black body model, the exercise gradually adds complexity by incorporating albedo, then a 1-layer atmosphere, then a 2-layer atmosphere, and finally a complex atmosphere with latent and sensible heat fluxes. With each step, students compare the modeled surface temperature to Earth's actual surface temperature, thereby providing a check on how well each increasingly complex model captures the physics of the actual system. This short video uses animated imagery from satellite remote sensing systems to illustrate that Earth is a complex, evolving body characterized by ceaseless change. Adapted from NASA, this visualization helps explain why understanding Earth as an integrated system of components and processes is essential to science education.